Just the job. Correct product for my motorcycle. Big difference when starting now. Next day delivery. I recommend Tayna, to friends, work colleagues and family. My only gripe, is that the batteries are packed in polystyrene foam, which makes a mess and sticks by static to everything! Great tracking of the order and well packaged battery. Completely happy with the service. 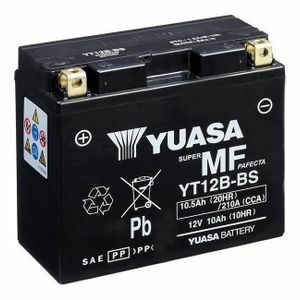 Have always used Yuasa battery for ducati 848 and find it the best. Fast shipping and well packaged by tanya batteries and at a good price. Excellent service and very quick postage as it was last time I purchased from Tanya,so no complaints whatsoever. Fast delivery even to other countries - works great. Ordered on the Monday received on the Tuesday, first class service. Quick delivery while being kept informed by tracking. Good price for top quality battery. Fast delivery (next day). People on telephone very helpful and knowledgeable. The battery arrived quickly without any problems. Filling, charging and fitting instructions were enclosed, and were easy to follow. So far the new battery has performed well. I needed a new battery to replace an inferior one and the Yuasa is the original supplied with the bike. So of course the battery is excellent as you would expect. Fantastic service, very fast. Battery is great Would highly recommend these people for anyone needing a new battery MANY THANKS !! Très content de mon achat et de la qualité de service Tayna.